Google and my online privacy, should I be worried? Help! Information has changed in my Facebook Account! ‘Off to meet your Internet Friends?’ was the slightly sceptical response in 2012, when I set off for the inaugural meet-up of the Writers And Bloggers About Spain group in Valencia. And after all, it did all start as a Facebook group, so you can see where they were coming from, if you didn’t know that WABAS wasn’t exactly like other Facebook groups. But it was such a great get-together that it was no surprise to find so many of us looking forward to doing it all again this year, and WABAS2013 in Malaga this month turned in to something everybody was pleased and proud to be involved with – an amazing experience. Because the WABAS group contains such a diverse and creative group of people who are all concerned with writing about or in Spain in some way, and the skillset and experience of the group as a whole is incredible. Journalists, pro bloggers, hobby bloggers, novelists, webmasters, publishers… The only connection everybody shares is a passion for Spain and the lifestyle here. And WABAS2013 was an opportunity to bring this group together to share and help each other in an altruistic and synergistic way, which became truly magical. The event was co-ordinated by Lisa Sadleir and Graham Hunt, and took place at the wonderful OnSpain language school in Pedregalejo. They generously opened their doors to us for the whole weekend, laid on a delicious paella lunch, and even more amazingly for November two days of glorious weather as well – so most of the discussion and breakout activity took place in the patio. 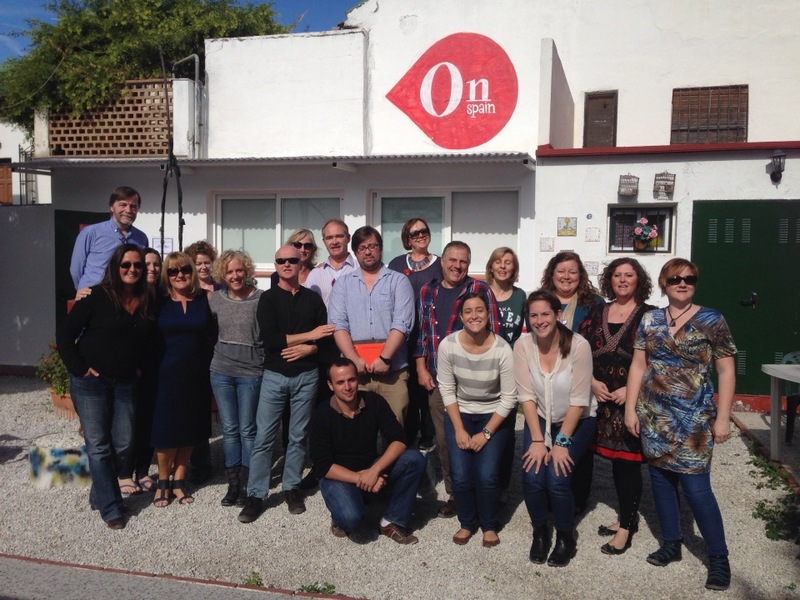 Chema, the director of OnSpain told us how impressed he was that an international group of expats in Spain were spending their weekend sharing ideas and their enthusiasms for writing, blogging and all things Spanish. Because WABAS2013 was all about sharing, and the programme was the same. Presentations were provided on subjects widely applicable to writing/blogging, business and social media, including using video, productivity and time management, developing elevator pitches, descriptive writing skills, website optimisation, self publishing, and even sherry appreciation! All brought to the group by WABAS members who said, ‘I can share something about this’ and offered it freely. Some people had said they felt awed by the idea of being amongst experts, but found the experience of the event itself was that everyone had something to share and which others could learn from and appreciate. One of the best sessions – that for me exemplified what WABAS is all about – was a speed networking event, where we all shared information about our projects and businesses and identified ways that people could collaborate and help each other. So often when you talk to people online even intensively you identify an individual with one specific website or activity… But when you meet face-to-face you see a rounded person with knowledge and contacts and ideas that cover a huge range of areas you would never have dreamed of. You find new and unexpected ways people can connect and share, and there are new ventures and collaborations launching already as a result of the meet-up this month. That’s something really positive to be associated with. Writers, creative people, entrepreneurs, we often tend to work on our own on our own stuff, and can miss the opportunities that come from the synergy of a like-minded group. Coming together as we did from all over Spain – and Malaga wasn’t exactly handy coming from the Costa Blanca – meant a chance to experience the local culture and cuisine as well, and the social informal time was also great fun. Learning to salsa, drinking mojitos, exploring the pueblos and finding fabulous tapas were all inspiring for good times and good company. Even the breakfasts and coffee breaks in the hotel were a chance to share and connect in new ways, and it was so good to spend time with friends old and new. And social media is what it all revolves around, because we all live so far apart in our own bits of Spain, and the rest of the time we connect online. Sharing each other’s blog posts through our Facebook, Twitter, Google+ and Pinterest is one simple way we help each other, and promoting each other’s businesses and new ventures, social media is perfect for this. share the learning and ideas that were springing up with people from the wider group who could not be there in Malaga, and anyone else who was curious, and that kind of cascading of excitement and knowledge is what WABAS is all about. If you’re curious about WABAS contact @casslar or @grahunt to find out more. Or perhaps you would like to host one of our meet-ups like onspainschool.com did, and see your social media following explode with new likes, follows, comments and enquiries? New posts, photos and information about the event are appearing daily now – the WABAS machine is powerful and synergistic, as well as interesting and fun to be around. Too easily people dismiss social media as an online phenomenon that has no impact in the real world, but WABAS2013 told a very different story. Well said. The collective knowledge amplified through real coming together of networking firnds.